disgusting. 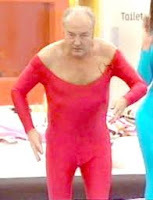 Galloway is a vile scumbag. I know the BBC is not always reliable, but in this case they may be right: on the Radio 4 news today they said that mozlems were the ones who voted for him. They interviewed some English people who had not even heard of him. I believe he only only campaigned in moslem areas, where he put in a leaflet which said he was more mozlem than the Labour incumbent. 18,000 is not a large number in a place of around 77,000 people. this was a stealth operation. Yep, just like a vulture, good ol' oily George swoops in on yet another easy picking constituency! Cynically rising British Muslim rights to buy votes - while at the same time helping dictators and thug bully boys in lands abroad to crush human ones! Tis a pity that some voters can't even be bothered to scratch the surface of George's smug and disengenuous two-faces! He ain't interested in the people of Bradford. Only the carpet-bagging platform it now gives him to further spread his money-spinning hubris ego. More profit out of the Prophet! And just like his good oppressive friends Khamenei, Ahmadinejad, Nasrallah and Castro, George Galloway is also rank and file of these bearded bandits!